Six brand new exclusives, going deeper and more diverse still, and brimming with musicality and good humour. This is vintage Judd: dazed and dubwise New York art-funk meets wonky skank in amongst the sozzled mongrels of Malian folk, rembetica and Gypsy jazz. Tip!! Who is Elmore Judd? Listening to Insect Funk should give you a pretty good idea. The first thing you'll notice is that he's got an amazing record collection. Insect Funk references an array of artists and styles; from between-the-sheets soul and P-funk to art-school disco and rock avant-gardism, UK hip hop and African roots music, horror soundtracks and jazz. You'll also notice that Elmore Judd has a vivid imagination; his world is populated by pirates, rats, Snakefinger, dead men and Tron. He lives in London. And he obviously knows how to have a good time - Insect Funk is an ecstatic, danceable, menacing record. He's probably the man at the party having more fun than anyone else and he's definitely going home with your date. Sound too good to be true? It is good, and it's almost true. Tease apart Elmore Judd's multiple personalities, and you'll find something like this…. 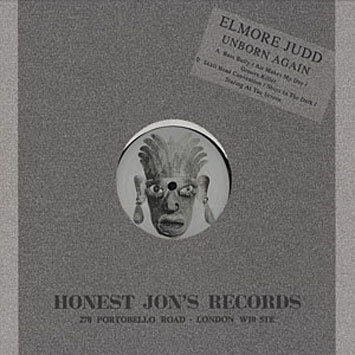 Jesse Hackett made the first Elmore Judd record, Angel Sound, more or less on his own back in 2005, had a thousand copies made and sold them outside Rhythm Records - formerly Honest Jon's - on Camden High Street. 'I'm not such a bad salesman,' Jesse remembers. 'One day I sold ten. And they were a tenner each, so it was £100. Not a bad afternoon's work.' Drummer Tom Skinner made a brief appearance on Angel Sound, but he's all over Insect Funk, playing a kit, primitive drum machines, scaffolding poles and pots and pans. Guitar duties are handled by Chris Morphitis, childhood friend of Jesse and Tom. He's also the bouzouki player and rembetika enthusiast. 'He's half Greek' Jesse explains, 'and he's really got in to his Greek thing. He's interested in 1930s underground Greek music, really dark, weird stuff, all about smoking hash and funny goings on in brothels'. Enrique Joyette is the band's secret weapon. His sweet vocals sit behind Jesse's on the record, but live he's a full-on soul shouter. He also kept the band alive while the record was being made, bringing his mum's West Indian cooking to the studio. 'We'd have no money,' says Tom, 'but at least we'd have something to eat!' Leon de Bretagne, the unmistakably French bass player, has also played with Bilal, John Legend, Ty and Estelle. Keeping it in the family, Jesse's brother Louis also lends a hand with percussion, keys and production. He's a veteran of the UK hip hop scene, turntablist to the Taskforce crew and originator of the £10 Bag mix CD series. Insect Funk was put together in Jesse and Louis's studio space, just off the Camden Road, in a pretty much derelict warehouse. Their nearest neighbours were the upholsterers upstairs, and the band could - and did - make as much noise as they wanted. Jesse: 'We recorded smashing some scaffolding poles out in the courtyard. Just started throwing them around to give it that industrial edge…' You can hear the results of this al fresco recording method on Don't Lie, a cover of the Snakefinger tune and the only non-original track on the album. So that's Elmore Judd; musician, music lover, survivor, fabulous figment of a collective imagination.